Vision system allows company to free up a manual inspector on the line for a more proactive assignment and run the inspection system without operators except for loading and unloading parts. When an injection molding operation is completed, pins on the movable side of the mold push the part out of the mold. In the past, the operator was responsible for checking the mold after each cycle to ensure the part was removed. Sometimes, the operator did not notice that the part had not been ejected—and the typical result was $14,000 in damage to the mold. Some manufacturers of parts such as electrical coils, solenoids, and electromechanical devices that go into complex assemblies for industries such as automotive, trucking, mobile equipment, medical, information technology and telecommunications applications have to adhere to high quality standards put in place by their customers. One particular company that was building a fuel stator for a diesel engine previously manually inspected every part to ensure that the lead tower cap had been attached with pins or screws and that the lead towers have been soldered. The company is penalized$2,000 for any defect on this part. Previous vision systems used by this company cost $10,700 for similar applications, but they were interested in a more cost-effective solution. A Cognex In-Sight® Micro 1050 vision system was proposed for this company that costs about $3,700. The application was developed using the vision sensor’s graphical user interface in one week and installed on the line in only 90 minutes. In its first full week of operation, it detected two defects, more than paying for itself. Most diesel engines use fuel injectors to deliver an atomized fuel charge to the engine cylinders. An electronic timing circuit delivers precisely timed electrical pulses for operation of the fuel injector. These pulses are delivered to a solenoid stator assembly which generates magnetic forces to actuate a solenoid plunger mounted in the fuel injector that controls the injection of fuel into each engine cylinder. 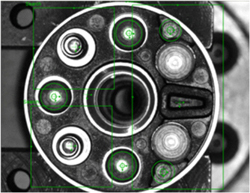 The housing of the solenoid stator assembly protects the internal electrical components and locates them precisely in relation to the reciprocating solenoid plunger. Two different types of fasteners—pins and star head screws—are used on the two different types of stators inspected on this line and the company needs to ensure that the correct screw is present. Each terminal also needs to be coated with solder so that it makes a good connection with the housing. Also, there are lobes located on the housing to the left and right of a cavity that could potentially be broken off, so the stators also need to be inspected for their presence. After experimenting with the application in the lab, engineers concluded that lighting is the key to this application. Various direct ring lights can be attempted but the CCS High Intensity ring light makes this application very robust. If there is a solder then the tips glow a bright white. If the solder is missing then the tips remain dark. The pins and screw verification also works very well with the prescribed lighting. The Cognex In-Sight Micro 1050 vision system was recommended because it provides both EasyBuilder® and spreadsheet application development interfaces. Cognex In-Sight Micro vision systems enable powerful vision applications using a small self-contained package available at an economical cost. Additionally, In-Sight vision systems feature the EasyBuilder interface that walks the user through the process of configuring the vision application step by step. The In-Sight enclosure is only 30mm x 30mm x 60mm and provides 640 x 480 (VGA) resolution. Engineers began by mounting the vision system and connecting it by an Ethernet cable to the network switch. The vision system is powered by a Power over Ethernet (PoE) adaptor. They configured the vision system with an IP address on the network that was immediately recognised by the Allen Bradley PLC that controls the production system PLC. The EasyBuilder interface automatically generates the Allen Bradley ControlLogix commands needed to communicate with the PLC. Engineers used the spreadsheet functionality to perform several filtering operations, including binarization and stretching, for each screw position. They used a series of contrast tools to search for each of the fasteners that should be present in the stator housing. The contrast tools measure the number of light pixels relative to the dark pixels within each area where each of the five screws and two lobes are supposed to be located. The next step after verifying the presence of the screws or lobes is the use of pattern tools to check the type of each fastener on the stator. The presence of solder is inspected simply by binarizing the image of each terminal and measuring the grey scale. Engineers identified the lobes by searching for the plastic circle on each lobe and verifying its diameter. They used EasyBuilder’s point-and-click communications setup to configure the vision system to send inspection results to the PLC after each inspection. In the deployment mode, color tools graphics, a results table and a filmstrip enable to the operator and maintenance staff to review images in order to verify the identification of bad parts and troubleshoot the application. The vision system has operated for six months and in this time it has never passed a bad part nor failed a good part. The result is that the company has been able to free up a manual inspector on the line for a more proactive assignment and run the inspection system without operators except for loading and unloading parts. The programmability of the vision system means that the company can easily modify the program to compensate for design or process changes.